Firewalls are intended to block threats from outside your network, but can sometimes block communication between devices on your network and cause problems when using network printers. Problems you might experience with firewalls include not being able print, the printer not being found on the network, or the printer status displays as being disconnected or offline, even though the printer is connected to the network. 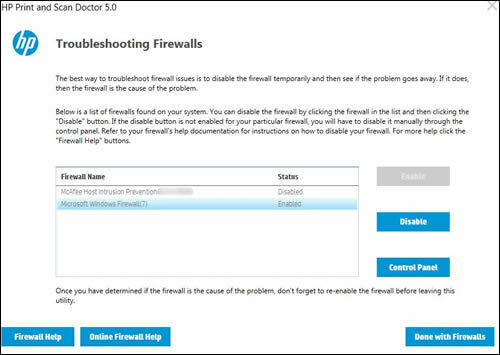 You can use the HP Print and Scan Doctor to troubleshoot issues with the firewall. On the desktop, double-click the HP Print and Scan Doctor icon to open the tool. Click Start on the Welcome screen. 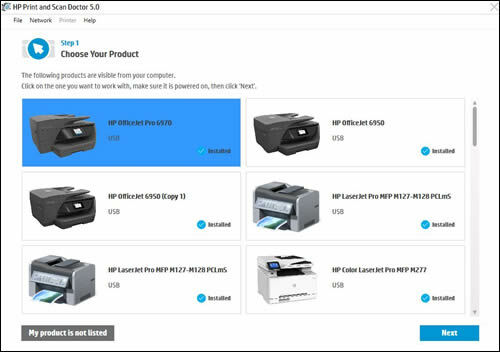 Select your printer, and then click Next. The Finding and Fixing Problems screen displays. In the HP Print and Scan Doctor window, click Network. In the drop-down menu, click Troubleshooting Firewalls. Follow the on-screen instructions to resolve firewall issues, or click Firewall Help or Online Firewall Help for more information.